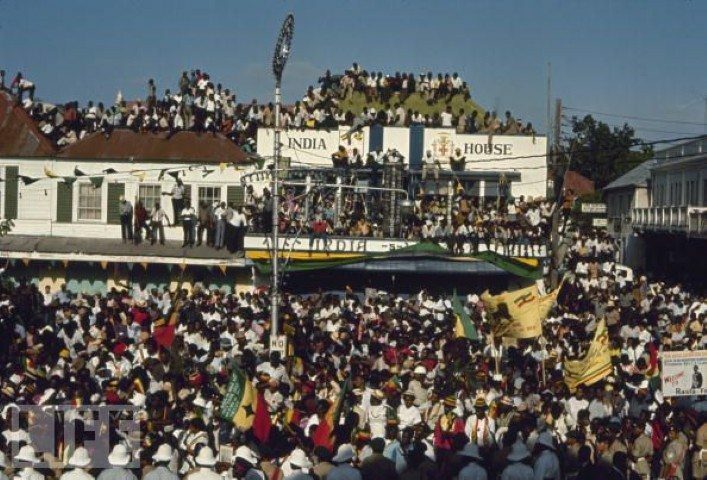 Haile Selassie visited Jamaica on April 21, 1966, and approximately one hundred thousand Rastafari from all over Jamaica descended on Palisadoes Airport in Kingston, having heard that the man whom they considered to be their Messiah was coming to visit them. Spliffs and chalices were openly smoked, causing “a haze of ganja smoke” to drift through the air. Haile Selassie arrived at the airport but was unable to come down the mobile steps of the airplane, as the crowd rushed the tarmac. He then returned into the plane, disappearing for several more minutes. Finally, Jamaican authorities were obliged to request Ras Mortimer Planno, a well-known Rasta leader, to climb the steps, enter the plane, and negotiate the Emperor’s descent. Planno re-emerged and announced to the crowd: “The Emperor has instructed me to tell you to be calm. Step back and let the Emperor land”. 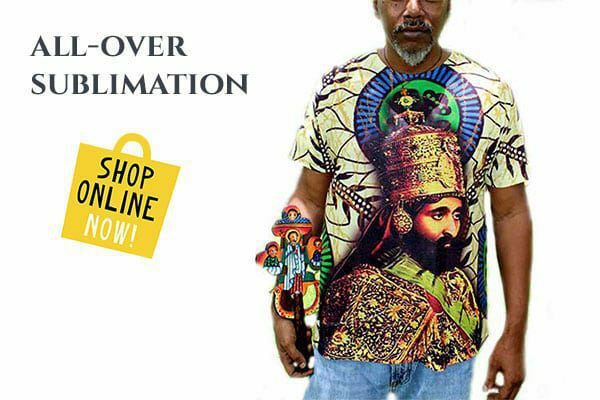 This day is widely held by scholars to be a major turning point for the movement, and it is still commemorated by Rastafarians as Grounation Day, the anniversary of which is celebrated as the second holiest holiday after 2 November, the Emperor’s Coronation Day. Haile Selassie defied expectations of the Jamaican authorities, and never rebuked the Rastafari for their belief in him as the returned Jesus. Instead, he presented the movement’s faithful elders with gold medallions – the only recipients of such an honor on this visit. During PNP leader (later Jamaican Prime Minister) Michael Manley’s visit to Ethiopia in October 1969, the Emperor allegedly still recalled his 1966 reception with amazement, and stated that he felt that he had to be respectful of their beliefs. This was the visit when Manley received the Rod of Correction or Rod of Joshua as a present from the Emperor, which is thought to have helped him to win the 1972 election in Jamaica. Grounation Day (April 21) is an important Rastafari holy day, and second after Coronation Day (November 2). It is celebrated in honor of Haile Selassie‘s 1966 visit to Jamaica. Haile Selassie had already met with several Rasta elders in Addis Ababa, and had allowed Rastafari and other people of African descent to settle on his personal land in Shashamane. Haile Selassie visited Jamaica on Thursday, 21 April 1966. Some 100,000 Rastafari from all over Jamaica descended on Palisadoes Airport in Kingston, having heard that the man whom they considered to be God was coming to visit them. They waited at the airport playing drums and smoking large quantities of marijuana. Today the Rastafari celebrate that Haile Selassie visited Jamaica on April 21st. When Haile Selassie’s Ethiopian Airlines flight landed at the airport at 1:30 PM, the crowd surrounded his plane on the tarmac. The day had been overcast and stormy. After about half an hour, the door swung open and the emperor appeared at the top of the mobile steps. A deafening tumult was heard from the crowd, who beat calabash drums, lit firecrackers, waved signs, and sounded Abenghorns of the Maroons. All protocol was dropped as the crowd pressed past the security forces and onto the red carpet that had been laid out for the reception. Selassie waved from the top of the steps; some interpreters have claimed that he shed tears, although this is disputed. He then returned into the plane, disappearing for several more minutes. Finally Jamaican authorities were obliged to request Ras Mortimer Planno, a well-known Rasta leader, to climb the steps, enter the plane, and negotiate the Emperor’s descent. When Planno reemerged, he announced to the crowd: “The Emperor has instructed me to tell you to be calm. Step back and let the Emperor land” After Planno escorted the African monarch down the steps, journalists were puzzled by Selassie’s refusal to walk on the red carpet on the way to his limousine. [hence grounation, Iyaric equivalent of foundation, “uplifted” with the sound of the word ground in the sense of “making contact with the soil”] He was then driven to the King’s House, the residence of Governor-General Clifford Campbell. As a result of Planno’s actions, the Jamaican authorities were asked to ensure that Rastafari representatives were present at all state functions attended by His Majesty, and Rastafari elders, including Planno and probably Joseph Hibbert, also obtained a private audience with the Emperor, where he reportedly told them that they should not immigrate to Ethiopia until they had first liberated the people of Jamaica. This dictum came to be known as “liberation before repatriation“. At a dinner held at the King’s House, Rastas claimed that acting Jamaican Prime Minister Donald Sangster had stamped his foot at Lulu, Haile Selassie’s pet chihuahua, who, they swore, had responded with the roar of a lion. Defying expectations of the Jamaican authorities, Selassie never rebuked the Rastafari for their belief in him as the Messiah. Instead, he presented the movement’s faithful elders with gold medallions bearing the Ethiopian seal – the only recipients of such an honour on this visit. Meanwhile, he presented some of the Jamaican politicians, including Sangster, with miniature coffin-shaped cigarette boxes. Rita Marley, Bob Marley‘s wife, converted to the Rastafari faith after seeing Haile Selassie in his motorcade en route to the King’s House. 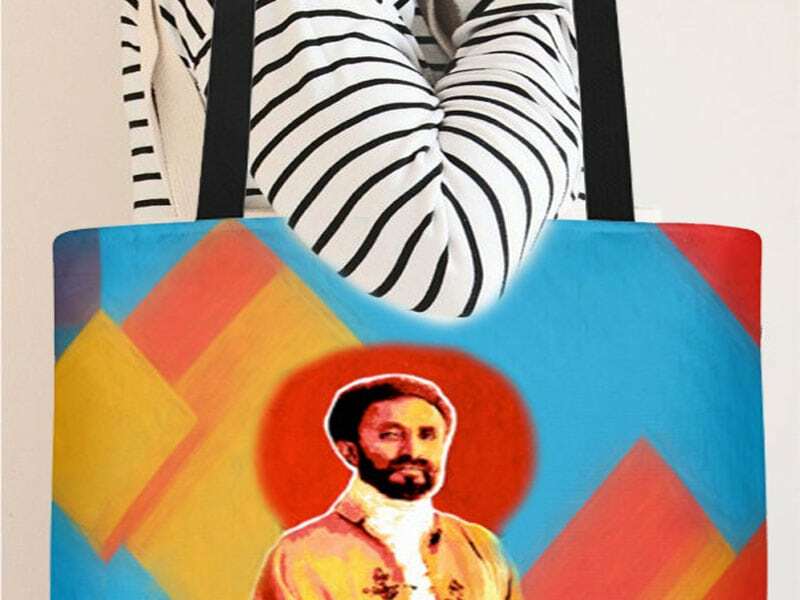 She claimed, in interviews and in her book No Woman No Cry, that she had seen a stigma on Haile Selassie’s hand as he waved to the crowd, and was instantly convinced of his divinity. For years afterward, Planno, who became a spiritual guru of Bob Marley, would give out enlarged photographs of himself with the Emperor on the steps of the airplane. The great significance of this event in the development of the Rastafari religion should not be underestimated. Having been outcasts in society, they gained a measure of respectability for the first time. By making Rasta more acceptable, it opened the way for the commercialisation of reggae, leading in turn to the further global spread of Rastafari. 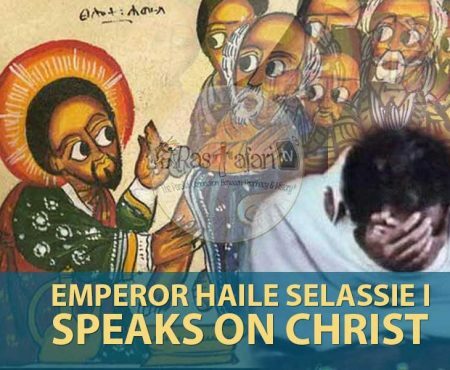 Haile Selassie is thought to have encouraged the Rastafari elders to learn about the Ethiopian Orthodox faith while in Jamaica, and in 1970, he dispatched Archbishop Laike Mandefro to establish a mission in Jamaica. Mandefro was formally invited by Joseph Hibbert, one of the original founders of the Rastafari Movement, to teach the Rasta community, and in 1971 Mandefro named Hibbert as a “Spiritual Organizer”. 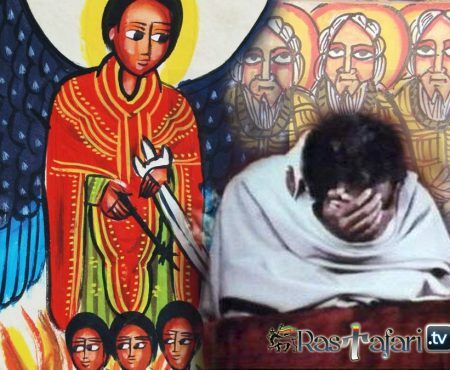 During this time, Mandefro pointedly refused calls to demand that the Rastafari renounce their faith in Haile Selassie’s divinity, and some 2,000 Rastas accordingly received Orthodox baptisms. Because of Haile Selassie’s visit, April 21 is celebrated as Grounation Day. The “Abu Ye! Abu Ye Abu ye! Abu ye!” chant is an element of Grounation Day festivities.